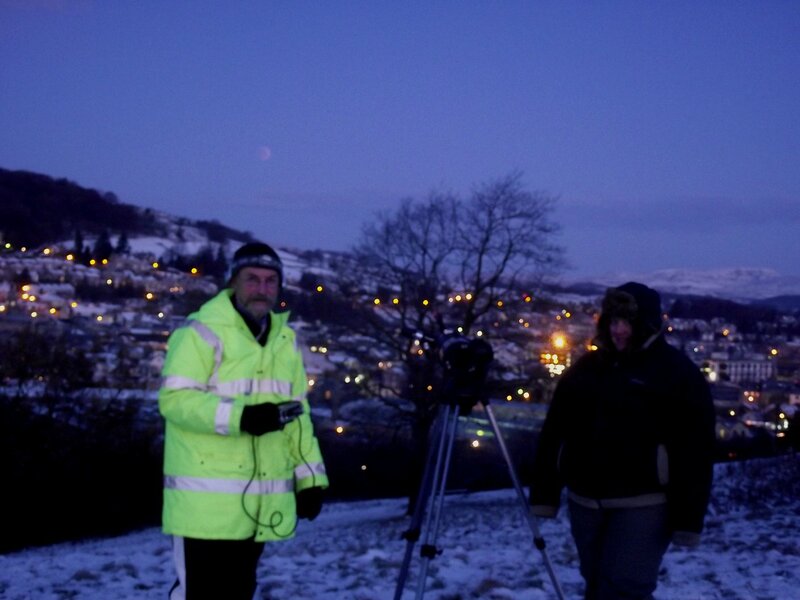 At 5.50am this morning, wrapped up like Arctic explorers, and carrying en0ugh equipment between us to put Himalayan sherpas to shame, Stella and I set off for Kendal Castle, our chosen viewing location for the eclipse. Everything was silent, apart from our boots as we crump-crumped through the snow, first through Abbot Hall Park and then up the steep hill to the castle itself. Behind us as we climbed the footpath the Moon was a blindingly-bright silver-white orb – and ahead of us, Venus was blazing like a lantern. It was literally a breathtaking sight. A few passers by (all of them dog-walkers; Kendal Castle hill is like dog central at any time of day, even on a crisp and frosty dawn!) 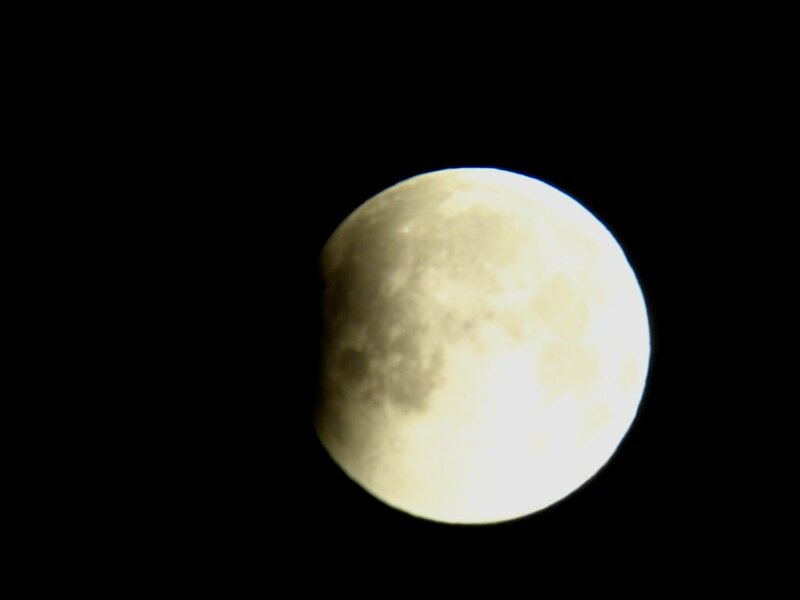 stopped to look in the telescope, and enjoyed what they saw before vanishing into the dark again. 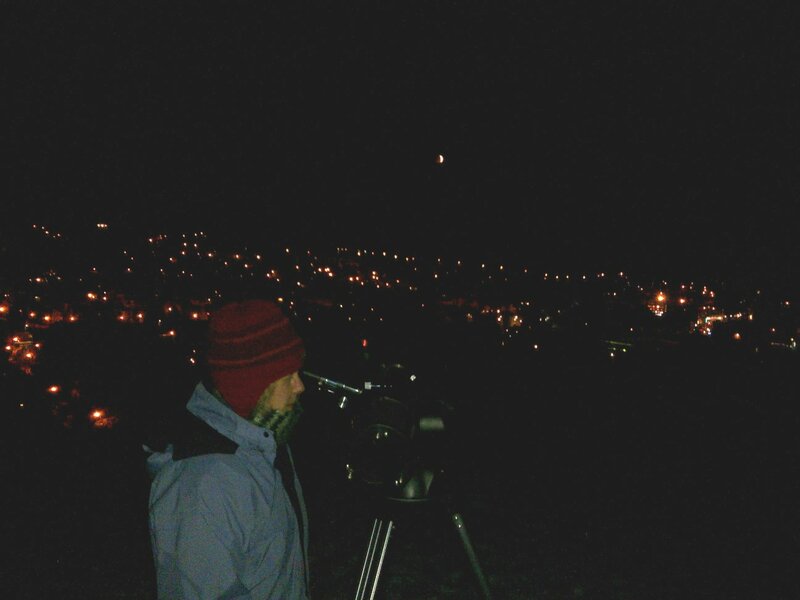 Our first attempt at a live broadcast was cut short when we lost the signal with the studio, but we managed to get a few words out on air, letting the people of Cumbria know what we were seeing, and urging them to go and look for themselves. 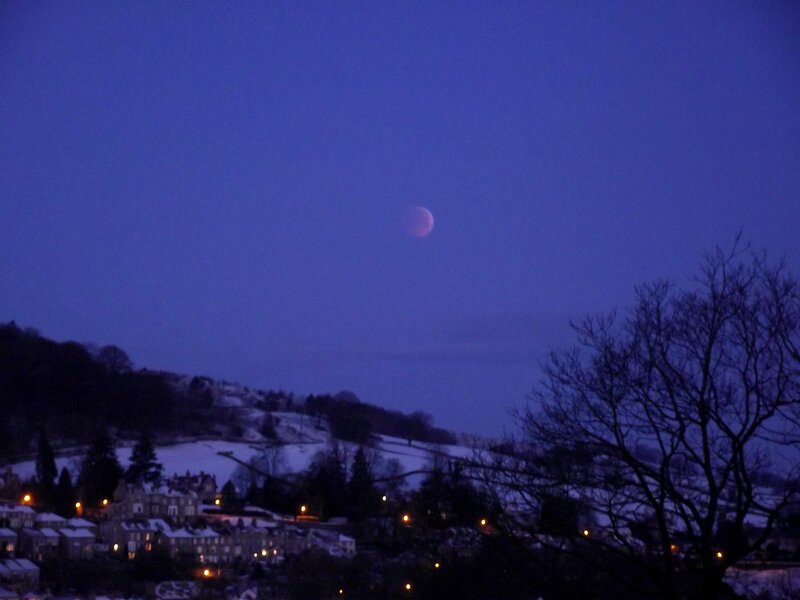 … but eventually we lost the Moon altogether – the sky was just too bright, and it was too hard to see it through the near-horizon mist and murk – so we packed up our things and headed back down the hill, frozen, and tired, but delighted with what we had seen. Somehow we made it down the ice-encrusted steps leading down from the castle without slipping and breaking our necks, and were soon home, more than ready for a cup of tea and a sit by the fire. So, we did it, we saw the eclipse, and judging by the reports and comments on Twitter, Facebook and across the internet, many thousands – probably millions – of people around the world saw it too. I am sure many of them enjoyed it just as much as we did, even if they didn’t have the Narnian surroundings or the Moonset conclusion. Some people think lunar eclipses aren’t really worth bothering with. They think they are too slow, too ponderous, too dull. 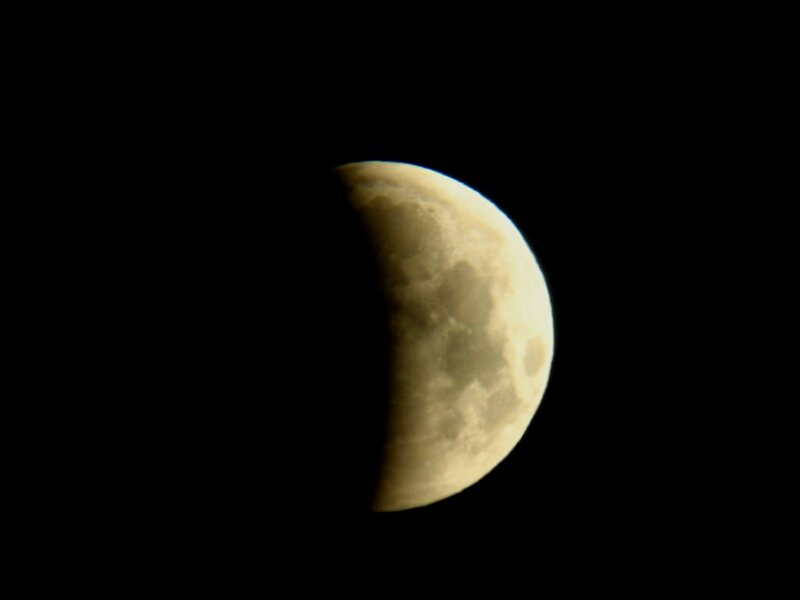 Last night I even read a Twitter comment by a hugely-popular and high profile US astronomer and broadcaster describing the forthcoming lunar eclipse as “boring”, comparing it to watching paint drying, and even urging his Followers to watch a time lapse video recording of it instead. Which appalled me, to be honest; I couldn’t understand how any astronomer – particularly an astronomer whose job it is, at least in part, to encourage people to look up at the sky, and see things happening up there with their own eyes – could actually discourage people from seeing an astronomical event for real. I wonder how many people who read his witty Tweets last night decided not to bother with watching the eclipse as it happened, and chose to just look at pictures and YouTube clips today? I wonder how many of them would have been telling their friends and colleagues at work today about the magical sight they saw in the sky last night? I wonder how many of them would have been inspired to go into a shop and buy an astronomy magazine, or go into a bookstore and buy a beginner’s guide to the night sky, if they’d watched the eclipse from their garden, or the park down the road, or even just out of their window? Because yes, lunar eclipses are slow. The view doesn’t change much from minute to minute. There’s no “wow!” moment when Something Amazing Happens. But they have a beauty all of their own, an eerie, other-worldly beauty, and watching one gives you – if your mind is open to such things – a real sense of the geometry of the solar system, especially the Earth-Moon system, as you see, with your own eyes, the shadow of our planet falling on another celestial body, stealing it briefly from our view. So, for those people who made an effort to watch the eclipse, who have patience, who don’t need their celestial events to be “wham-bang!” Michael Bay special effects, who can appreciate the majestic nature of such a slow-motion event, who can appreciate the wonder and beauty of the night sky, it was a wonderful night, and one they’ll remember for a long, long time. Thanks for this nice report! While clouded out (and in far decidedly geometrical conditions than you anyway), the eclipse actually turned into a frantic and exciting 3-hour affair, following several webcasts and Twitter feeds simultaneously. Having “eyes around the globe” – from Central Europe to Australia – was a good consolation prize: The best catches are are linked from this blog post, including this one here, of course. Lakeland Cam, a site I visit for my daily dose of Cumbria, caught the eclipse too, from Windermere, just to the west of you.